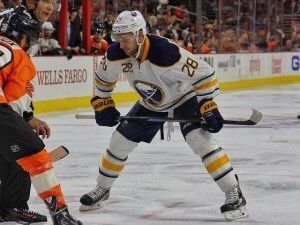 Last season the Buffalo Sabres began the next stage in their rebuild with a revamped roster. New full-time additions to the team included Jack Eichel, Sam Reinhart, Ryan O’Reilly, Evander Kane and Head Coach Dan Bylsma. The fan excitement for the club was back again after two terrible seasons. The season started off slow as chemistry issues and injuries started to mount. Players took some time getting familiar with new faces and learning a new system at the same. Defensive zone lapses were occurring on a nightly basis. It appeared like more of the same from the previous two years. The injury bug hit the Sabres right away last season. Zach Bogosian and Brian Gionta suffered training camp injuries that caused them to miss the start of the season. The biggest injury was to new goaltender Robin Lehner on opening night. Only one period into his first regular season start with the Sabres, Lehner, went behind the net to get a meaningless dump in. Unfortunately, he ended up twisting his ankle resulting in a high ankle sprain and forcing him to miss the majority of the regular season. The Sabres limped to the halfway mark of the season with 34 points and tied for last place in the NHL standings. However, over the final 41 games of the season the team turned it around. The players became familiar with Bylsma’s system and the team recorded 47 points in the final 41 games. Playing the final half of the season at a 94 point full season pace is a promising sign heading into this upcoming. The NHL club didn’t see many organizational changes this offseason, but the Sabres organization did have a shake up with their AHL affiliate — the Rochester Americans hired Dan Lambert as their new head coach. Lambert spent last season with the Sabres on Bylsma’s staff. The transition for Lambert was the plan all along, spending last season getting familiar with the Bylsma’s system that he will now teach it to the prospects at ‘Sabres University’ in Rochester. Lambert will be expected to turn the Americans around this season as the last two years have been very disappointing. He’ll have players like Casey Nelson, Hudson Fasching, and Alex Nylander that he’ll play a role in helping to develop. General Manager Tim Murray believes that setting a winning precedent in the minors goes a long way to building a strong NHL team. In his second NHL season, all eyes will be on Eichel again. The 2015 second overall pick is the unquestioned face of the franchise and will be expected to exceed the performance of his rookie season. Last season, Eichel, scored 24 goals (most on the team) and 56 points (second on the team) in 81 games. Eichel found a good chemistry with 2014 second round pick Reinhart near the end of last season. The two have the potential to be a dangerous duo at only 19 and 20-years-old respectively. The other top center, O’Reilly, will be relied on a lot again next season. The 25-year old is one of the most underrated two-way centers in the NHL. He played the highest average minutes per game among any forward in the league last season. O’Reilly is one of the leaders of the club and Bylsma will lean heavily on him again this season in a variety of situations. 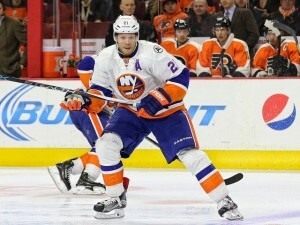 Kyle Okposo will be another player in the spotlight this season. After signing his big seven-year $42 million contract as a free agent, the Sabres expect big things from the former New York Islander. Okposo will likely slot in on the top-line with O’Reilly. The two play a similar style and hopefully can find some quick chemistry. Newly acquired Dmitry Kulikov will look to step into a top-four defenseman role with the Sabres this season. Coming over from the Florida Panthers, Kulikov, plays a physical game and has some offensive upside. The Russian defender is set to become an unrestricted free agent at the end of the season. 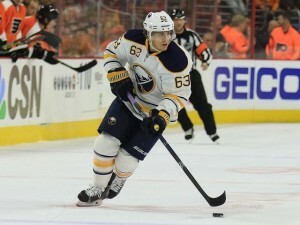 The Sabres hope to see him find consistency this season playing along young blueliner Rasmus Ristolainen. Speaking of Ristolainen, he’s coming off a career year scoring nine goals and 41 points in 82 games. The Finnish native is still unsigned as a restricted free agent. However, the two sides will likely get a deal done prior to the start of training camp. 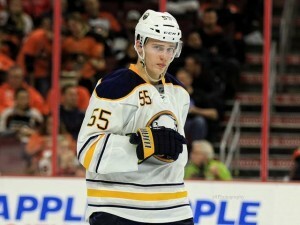 Ristolainen will need to stay on the path as the organization’s unquestioned top defenseman. The addition of a more reliable partner should take some of the pressure off the 21-year old. Brendan Guhle will be a name to keep an eye on throughout training camp. The 2015 second round pick nearly made the team last season before getting injured at the end of camp. Guhle has added some weight to his frame and will take another run at making the big club. He’s arguably the top prospect in the Sabres farm system. Guhle is such an excellent skater and a great puck mover. Long-term he may be the top pair guy with Ristolainen, but he could begin his NHL career this season in a smaller role. The 19-year old will likely force Murry and Bylsma to make a tough call. If he doesn’t make the roster he’ll have to be sent back to juniors instead of the AHL due to his age. Goaltending is without a doubt the biggest question mark on the Sabres roster. Lehner is the obvious starting goaltender, but the question is his health. The big Swede is still recovering from ankle surgery in April. He’s been on the ice working out in Buffalo, which is a good sign for his availability come October. In his 21 appearances last season, Lehner, was good with a .924 save percentage and 2.47 goals against average. Buffalo needs to get at least 60 to 65 games from Lehner next season. Chad Johnson filled in very well in his absence last season, but he signed with his hometown Calgary Flames as a free agent. If Lehner does indeed go down for an extended period of time again the Sabres could be in a lot of trouble. Anders Nilsson is a pretty unproven goaltender in the NHL and Linus Ullmark isn’t ready for full-time NHL playing time yet. Although Ullmark was impressive at times last season, he showed his inexperience on numerous occasions. 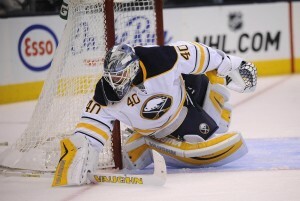 The Sabres hope is for Ullmark spend the entire season in the AHL as a number one goaltender. A lot rides on the shoulders of Lehner next season. His health and consistency will be extremely important for Buffalo if they want to contend for a playoff spot. Anders Nilsson is a pretty unproven goaltender in the NHL and Linus Ullmark isn’t ready for full-time NHL playing time yet. Although Ullmark was impressive at times last season, he showed his inexperience on numerous occasions. The Sabres hope is for Ullmark spend the entire season in the AHL as a number one goaltender. A lot rides on the shoulders of Lehner next season. His health and consistency will be extremely important for Buffalo if they want to contend for a playoff spot. Fresh off his new one-year $1.15 million contract, Zemgus Girgensons is primed to be the breakout player of the season for the Sabres. Two years ago, the 2012 first round pick had a career year scoring 15 goals and 30 points in 61 games. At the time, Girgensons was playing top line minutes under Head Coach Ted Nolan. Last season, the role for the 22-year old changed under Bylsma. In fact, Bylsma struggled to find the right spot for Girgensons. He played all over the lineup and struggled again with injuries. After all was said and done the production was a disappointment last season with seven goals and 18 points in 71 games. This upcoming season the Latvian native is in a “prove-it” year with the organization. Girgensons has been healthy all summer and spent time in Buffalo training. The Sabres appear to have a defined role set for him as the third line center on the club. Projecting out the roster, Girgensons, should have the opportunity to play with high potential players like Justin Bailey. Also, he should have the chance to play top-six minutes in various situations. All signs point to him having a good bounce back season with the Sabres. His shooting percentage should jump up from a poor six percent last season to closer to his 2014-15 shooting percentage of 13. He’ll also have a clearly defined role on the team and be given the opportunity to contribute offensively. Is Girgensons the 20 goal pace scorer he was two years ago? Probably not. However, I believe he has the ability to score 12 to 15 goals and be an important part of a deep roster. Tyler Ennis will be back this upcoming season after missing the majority of last season with a concussion. Many predicted a big season from the 26-year-old forward. A slow start and injuries added up to a very disappointing 2015-16 season for Ennis. Coming into this season, Ennis, is almost a forgotten player on the roster, when in fact, his return is extremely important to the Sabres. If he can stay healthy the 2008 first round pick solidifies the Buffalo top-six forwards group and adds a career 20 goal scorer to the lineup. The Edmonton native has never played with the talent he’ll be surrounded with this season. Which is the primary reason many predicted a career year last season. Ennis is a dynamic talent that, when fully healthy, has the potential to be one of the top scorers on the club. He’s coming back this season after a little bit of a wake-up call last season and a chip on his shoulder. He’s trying to prove to the organization and league that he’s still a dangerous top six forward. A full season with linemates like Eichel and Reinhart has the potential to get Ennis to the production many expected a year ago. The Sabres get a gift in the case of Alex Nylander. The 2016 eighth overall pick will not need to return to juniors or his home country of Sweden for that matter if he does not make the big club as expected. Since he played for the Mississauga Steelheads of the Ontario Hockey League on loan from Sweden last season, he’s eligible to play in the AHL. Nylander has the ability to begin his professional career right away and be only 90 minutes away from Buffalo if they need him for an injury replacement. A season in the minor leagues should expedite the development of the 18-year old and potentially have him ready to be an NHL regular next season. As the season progresses, Nylander may see time with the Sabres if his season is going well for a potential playoff push. Casey Nelson stepped right into the NHL at the end of last season as a college free agent from Minnesota State. Nelson showed well in his seven appearances recording four points in those games. He has excellent hockey IQ and vision, which allows him to compensate in areas of his game where he’s not so strong. Although Nelson has the potential to make the Sabres roster in training camp, it’s more likely he’ll begin the season in Rochester. He can work on fine tuning some areas of his game and the Sabres can keep an eye on his progression. In the scenario of a defender struggling or injury, the Sabres will be quick to bring the 24-year old back to the NHL. The upcoming season for the Sabres is about competing for a playoff spot. Buffalo has not made a playoff appearance since 2011. Last season the team to a big step towards being a competitive team with how well they’ve played in the second half of the season. The good news for the Sabres is how open the Atlantic Division appears to be heading into the season. The Florida Panthers and Tampa Bay Lightning seem like shoe-ins for the top two spots in the division. However, the third spot could be up for grabs. Along with the Sabres, the Montreal Canadiens, Boston Bruins, Detroit Red Wings, and Ottawa Senators should all be in the mix for that third position in the division. The Sabres are set up to be a playoff contender this season. The additions of Okposo and Kulikov will go a long way to solidifying the roster. Okposo will provide more scoring in the top six while Kulikov will give Ristolainen a legitimate top pair partner. Eichel and Reinhart will be entering their second full season in the NHL. The young duo will be looking to build on an impressive rookie season that saw them combine for 98 points. If Buffalo can get off to a good start and get some of the luck they were unable to find last season they could jump into a playoff spot this season. The club struggled in shootouts last season winning only two of their seven shootouts. Also, the Sabres found themselves on the losing end of one goal games far too often. Roster improvements and some puck luck can be the difference in a playoff team or not. The club will very likely improve on their 81 point season, but it still may not be enough to end the playoff drought. The Sabres are on their way up and have the potential to be a contender in the Eastern Conference for the foreseeable future. I expect another big step towards that goal, but the playoffs may still be just out of reach this season. Make sure to comment below with your opinions on how the 2016-17 season will play out for the Kings or head over to the THW Twitter feed or Facebook page and sound off about all our NHL coverage.